Let me just start by saying that this book is a dystopian novel. If I hadn’t known that going in I don’t think I would have really noticed. I wish there had been more development with the world/setting to make it seem more futuristic. There was one point where they were in an antique shop and there were iPods, but that was pretty much it. The book was great! It was a little tough getting into it but it became extremely intense towards the end and I couldn’t put it down! The ending was a total surprise and I loved how the story kept going until the very last second. However, the drawback to this was that the beginning was a bit confusing. 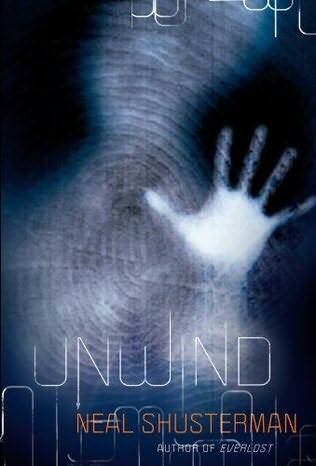 The war that lead to “unwinding” I felt wasn’t described enough and that’s what caused most of my confusion. Apparently there’s going to be another book after this one, and I could see how that would work, but it could also just stay as a stand-alone if you didn’t feel so inclined to read the next one. Don’t you just love the cover too? It’s awesomely creepy! So, if you like tons of action and a slight dystopian take, then I would say pick this up!